Summary: The teacher of the Law tested Jesus with a question that made sense to him but is nonsense to God. He confused Law and Gospel, asking how to earn a gift, specifically, the inheritance of eternal life. Jesus’s story of the Samaritan continued to point the man down the path of works, evidently because He judged the man unready to grasp salvation by grace through faith. The lawyer couldn’t earn what was already God’s gift through the same Jesus whom he came to challenge. We inherit eternal life because Christ died and left everything to us in His “will” — His testament of body given and blood shed on the cross. We can do nothing to inherit because “it is finished (John 19:30)” and we possess our inheritance through God-given faith. Audio: Click to hear the MP3 of Unearned Inheritance. Illustration: Vincent van Gogh, 1853-1890. 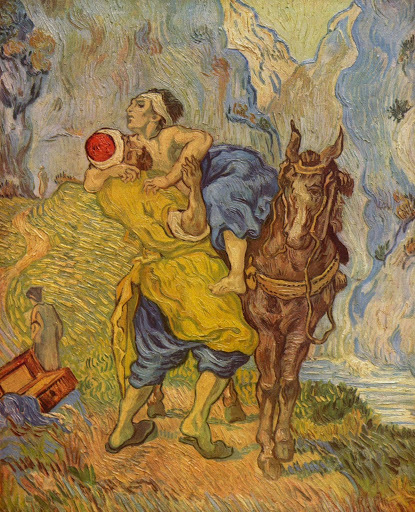 Good Samaritan (1890), from Art in the Christian Tradition, a project of the Vanderbilt Divinity Library, Nashville, TN. [retrieved July 12, 2016]. Click for original source.